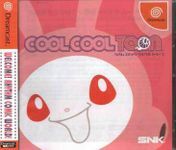 "Cool Cool Toon is a rhythm-based music video game exclusive to the Dreamcast. It was developed and published by SNK and released in Japan only on August 10, 2000. The letters A, B, X and Y appear at the edge or in the middle of a large circle on screen. The player must use the analogue stick to move a marker to the letter and press the corresponding button on the controller at the right time. If the player misses too many letters, they will fail." Source: Wikipedia, "Cool_Cool_Toon," available under the CC-BY-SA License.